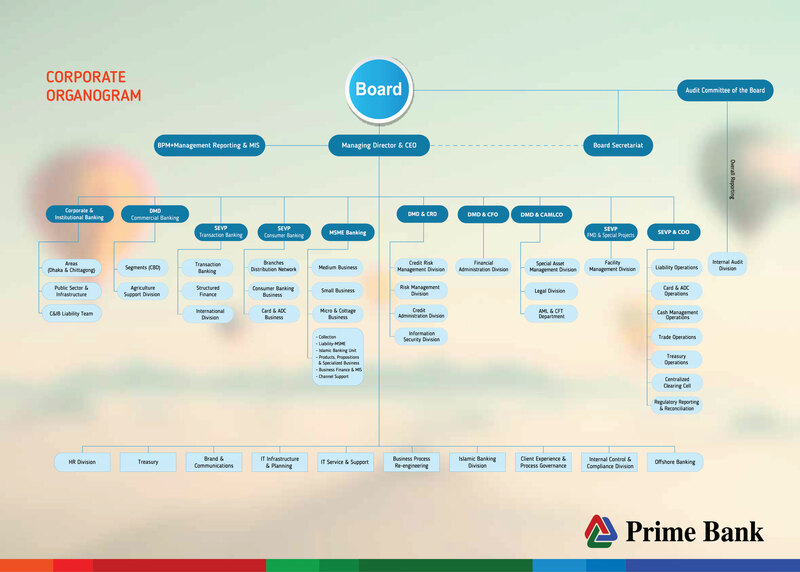 Prime Bank Ltd has already formulated Green Banking Cell (GBC) headed by the DMD & Chief Risk Officer (CRO) to administer the related issues of green banking. The bank's "Green Banking Policy" and "Green Office Guide" has already been formulated & circulated to create awareness on green banking issues & providing required instructions on efficient use of energy, water, saving paper etc. The Risk Management Committee of the Board of Directors of the bank will act as the high powered committee for reviewing the banks' green or environmental policies, strategies and program for governing the overall green banking activities of the banks. Prime Bank Limited has established a separate cell under Corporate Banking Division named as "Green Financing Cell" comprising representative of relevant divisions i.e. Corporate, Agriculture, SME and Export Finance for green financing under refinance scheme of Bangladesh Bank to set up Effluent Treatment Plant (ETP), Bio-gas Plant, Solar Energy (i.e. Solar panel, Solar home System, Solar mini Grid, Solar irrigation pumping system, Solar PV Assembly plant), Water Electricity Plant , PET bottle reprocessing plant, Solar battery reprocessing plant, bulb production based in LED technology, Hybrid Hoffman Kiln (HHK)/Tunnel Kiln, Converting into Zig-Zag/VSBK from traditional local based brick field, Organic manure Production and Vermicompost. During 2013, our bank has extended finance of Tk 25.40 million for installation of ETP and Tk 373.52 million for financing 3 projects having ETP. The bank has further strengthened its green banking initiatives by financing environment-friendly Hoffman Kiln and Zigzag based automated brick fields, which contribute towards a greener climate. The bank disbursed 49.50 million for financing Hybrid Hoffman Kiln (HHK). The bank has also extended finance of Tk 0.35 million to set up of 2 bio gas plant. We are also looking forward to finance Vermicompost as bio-fertilizer and bio-pesticide project. Prime Bank has been one of the pioneers in introducing electronic banking. It covers 134 online branches, 151 own ATMs, 1215 shared ATMs. Our clients can access to their personal accounts through Internet & Mobile Banking. The bank has been operating with Bangladesh Automated Clearing House (BACH) system, which allows paperless cheque clearing. i.	Real-time fund transfer between different accounts of the bank. ii. Fastest interbank fund transfer through BEFTN (Any Bank, Any Branch). iii. Credit Card bill payment of Prime Bank and other banks through BEFTN. iv. Real-time statement view & download option for transaction A/C, FDR & Deposit Scheme Statement. v.	Instant recharge of prepaid/postpaid mobile number of any local telecom operator and WiMAX accounts. We are gradually expanding the list so that our customers can do many other transactions within the comfort of their own home Online. Prime Bank has installed solar panels in 16 branches and 4 ATM booths located at different regions of the country. Bank's Human Resources Division has implemented online HR services namely HR Connect by which employees can obtain certain HR services from their own work station without initiating any hard copy of paper. Prime Bank has observed "Earth Day" on 22nd April, 2013 to demonstrate its commitment toward environmental issues and distributed small plants along with a printed message of Managing Director & CEO to some of its valued customers as token for building awareness on climate change issues. There is a particular session on Green Banking activities in the orientation training program arranged by bank's Human Resources Training & Development Center for all Management Trainee Officers & other fresh joiners. The bank has been regularly reporting its green banking activities to Bangladesh Bank on quarterly basis since 2011. In view of highlighting our Green Banking activities and creating awareness amongst our stakeholders, a separate section on our Green Banking activities has been incorporated in our Annual Report. Based on the green banking activities during 2012, Bangladesh Bank has recognized Prime Bank as one of the top ten private commercial banks for its contribution to Green Banking activities across the country. Under the policy guidelines for green banking of Bangladesh Bank, Prime Bank Ltd is committed to sustainable business that brings benefit to the society, environment and the economy of Bangladesh. We are looking forward to expand our green banking initiatives in the coming years and expect to maintain our pioneer position in the industry.